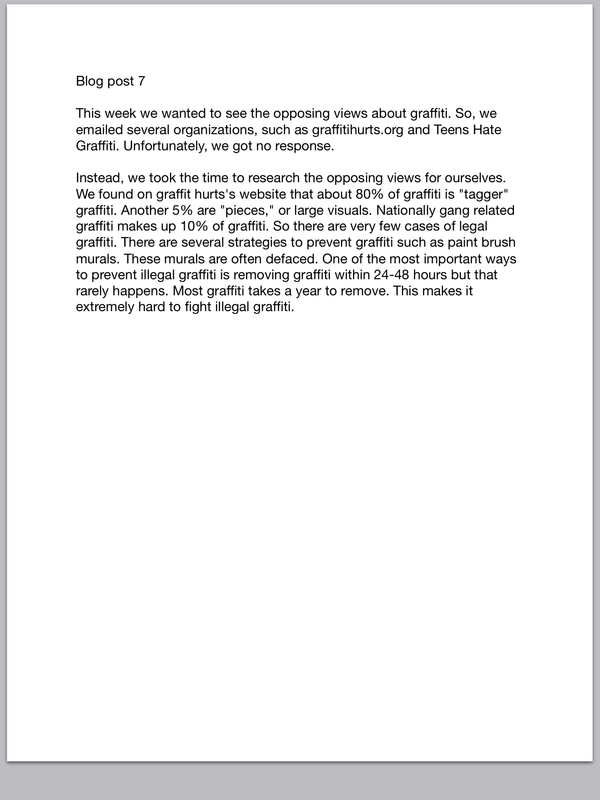 This quote from the website we found particularly powerful: “A huge amount of social science throws [graffiti] into a camp of being a sign of crime and disorder,” Douglas, a Ph.D. candidate at the University of Chicago, says. “The truth is, at this point, some graffiti and street art are arguably contributing to gentrification and contributing to increases in the appeal of certain neighborhoods.” A section of this article tackled the cosmetic advantages of Street art. It talked about how the artwork can make a building (or a whole neighborhood) look better when it’s generally shabby or trashy looking. The artwork can cover up unsightly or abandoned buildings, when done appropriately and moderation. This poses a potential problem though; when people don’t approve of usage of their building. “Late last year, 5Pointz a graffiti hotspot in Queens, New York, was whitewashed, erasing years of graffiti by artists from all over the world. Since the ‘90s, street artists have been allowed to spray paint the walls of the warehouse in Long Island City, and the work that appears has long been curated by the graffiti artist Meres, whose goal was to turn the industrial space into a graffiti museum. More recently, the building’s owner, Jerry Wolkoff, forged ahead with plans to tear the warehouse down and turn the property into high-rise apartment buildings, starting by painting over the existing graffiti.” Situations like this are tricky. Unfortunately, not much can be done without cooperation of the building owner. If more people were educated about this delicate art form, there would be a lot more of it around. Most people can not find the value in this art, which is damaging to the community because it is so easily dismissed as vandalism. One of our goals as a group is to break down this stigma by creating a bill to protect those who create genuine art without malicious intent. Thinking about your Project Citizen topic, consider the type of public policy you are trying to implement in your solution. Then, review the matrix of the levels and branches of government from last class. Which level within the legislative branch do you need to work with to craft your policy? Are there other branches you need to work with as well? We thought that these facts were the most important for what our project topic is . We are going to altering a local public policy . Domestic policy that fall under public assistance . We would be working with the legislative branch. What are the strengths and weaknesses of the different mediums of media? 1.The general shape of public of public opinion on an issue can be found through a number of key indicators .They include voting; lobbying books pamphlets and magazines and news paper articles along with news headlines on tv the Internet is also a huge source for news and finding new topics to talk about . 2. The different forms of media have shaped the ways people think about politics and also it will also persuade them to vote in other parties if the candidate if persuading them well enough to go into another party of politics in the future . 3. A medium that is means of communication it transmits some kind of information media is the plural of medium . The mass media include those means of communication that can reach large widely dispersed audiences simultaneously .Also mass media is another way that big politicians can keep trying get into your head and get you to vote for them along with staying in that specific party as well . 4. The public and or the citizens be the one who will be the ones who are consuming the information and getting the to decide who they want to vote for and what party they decide on and also if the party they are if they are in on is the correct one for them at the time . Also that data is. Received by the local government and or the federal government to find out who is voting for who and also see who is switching parties as well . What does the media say about your Project Citizen topic? Pretty much, the media doesn’t really favor street artists. It is unfortunate that a stigma has been placed on street artists, because when people think of graffiti, they generally associate it with vandalism. Are there certain times or instances when your topic becomes of particular importance to the media (and therefore society)? If so, when? Discuss the moments when your topic becomes of greatest interest to the public. Graffiti occasionally grabs the media’s attention when an art piece resonates within a lot of people. This usually occurs when a political statement is made that intrigues people, or an exceptionally beautiful piece is created. How does the media present your topic? Positively? Negatively? Etc. Whose voice or what perspective is heard the most regarding your topic? Whose voice or what perspective is underrepresented when the media talks about your topic? Normally, our topic is presented in a negative way. People who don’t understand the reasoning behind it dismiss all of it as vandalism. However; people in the art community are very accepting of it and generally support it. The perspective that isn’t represented is definitely the artist. The voice that is heard is usually that of the critic or non supporter. Based on your research, what is the media NOT saying that they should/could be?How could the media reduce bias regarding your topic and present more holistic, well-rounded information? The media should be highlighting the amount of effort that goes into what these artists do. They should be showing how beautiful and expressive this art form is, and let these people be free of judgement, even from their own community. The media could present better information by speaking to the artists themselves, and not critics ready to tear them down. The only era that we can break the stigma about street art is by talking about it. We are writing this blog for anyone that can appreciate art and the act of self expression. Wether that be a stay at home mom that enjoys art, or a politician that is ready to fight for street artists that don’t have a voice. We want this to be for anyone that has an interest in street art and supporting a good cause in their local art community. So far, we have gathered some information pertaining to our topic. From research, we were able to conclude that there is a bit of a grey area when it comes to laws having to do with street art. The majority of art falls underneath the blanket term of vandalism, and has little support as it’s own genre. This is unfortunate, because this makes our task of finding a specific law/public policy about street art harder to find. However; a good question for us to raise in our information is what is the line between art and vandalism? We believe that this question may be a large starting point in our cause. With the evolution of social media and art sharing blogs/websites online, street art is easily one of the most relevant and talked about art forms with the younger generation of artists right now. We think what is so attractive about it to people is that the possibilities of it are endless. It is unfortunate that this art form has such a negative connotation behind it, but if we can all try to be a bit more optimistic about something that many people may not understand, we can make progress. 1.) what do you and your classmates want to study? The laws/regulations dealing with street artists. 2.) how serious is this problem in your community? In noblesville, I do not believe that this is a BIG issue, but the Indianapolis area? Yes. 3. )how widespread is this problem in your community? If you take a look anywhere around Indy, you will most likely see grafitti/street art. 4.) why should this be handled by the government? Because street artists are being prosecuted for expressing themselves, and we want to help resolve this issue. 5. )should anyone else take responsibility? Yes, the artists themselves should, but this is how they express themselves. We want to try to find a middle ground for both sides. 6.) yes, there are laws. They aren’t specific to street art, but the blanket laws regarding this issue would refer to it as “vandalism”.